Learn more about how Checkups can improve your dog’s dental health. Your dog will feel better with Checkups dental treats – and you will, too. 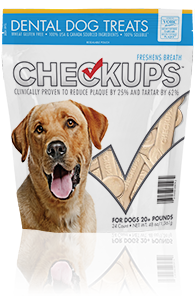 Through rigorous testing performed by scientists and trained technicians, Checkups are clinically proven to improve canine dental health. From reducing plaque and tartar, to stimulating gums, to containing omega-3 fatty acids, there are many benefits of feeding your dog Checkups. Through rigorous testing performed by scientists and trained technicians, Checkups are clinically proven to improve canine dental health. Read comments from happy Checkups users! My lab loves Checkups and his vet loves them also – says his teeth and gums are the best! Thank you for your interest in Checkups treats. Use the form below to contact us about pet nutrition or our product.